Since their introduction in 2012, Tide detergent pods have been a lightning rod for controversy. Initially packaged in clear plastic, candy jar-like container, the glossy, orange, blue and white pods tempted an alarming number of children into taste-testing them. Procter & Gamble, the makers of Tide, have subsequently made the packaging opaque and more secure, but one woman who says her grandson almost died after biting into a Tide pod says more can be done to make the product less yummy-looking to children. She thinks the existing warnings on the pods don’t go far enough and don’t get at the real risk of the product. 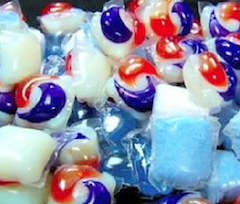 We don’t know if there is evidence to support this claim of hundreds of children being sickened every week, but there is no doubt that there has been an uptick in detergent poisoning since Tide launched the pods. In August, a 7-month-old in Florida died after ingesting a detergent pod. The specific brand was not given, but as we’ve shown, even some Tide knock-offs have been packaged in questionable containers, though at least Costco has updated its container to be opaque. The petition currently has around 30,000 signatures.